Tam Dao Belvedere is one of the most high-grade and luxurious resort in the North of Vietnam, with 48 elegant villas and suites, located in the most ideal place of 30 ha area in Tam Dao Mountain. At an elevation of 1200 meters, surrounded by sheer cliffs and jungle, along with fresh, pure and cooling air, beautiful scenery, Tam Dao is an attractive place for both local and foreign tourists to relax and do research on rare animal. In addition, it takes only 90 minutes from Hanoi to Tam Dao; which is very convenient for a wonderful trip. Having the geographical advantages of Tam Dao Mountain and professional services, Tam Dao Belvedere Resort will bring you unforgettable experience. We wish to serve you with best services for every moment of relaxing! Restaurants luxurious and cozy overlooking the valley Tam Island, with a bar and separate dining room 03 is uniquely designed according to the different styles. The restaurant not only serves cuisine Vietnam but also delightful flavor of Europe, the world-famous wines and specialties of the mountains in Tam Dao Belvedere Resort only. Is where you pick up the first morning sun while taking breakfast or cold breezes in the evening the fine cup of coffee. Here, you seem to be flying between heaven and earth, harmony with nature liberal. The Terrace Café is open from 6 am to 10 pm. The Club is where you can dangle under the vibrant music, enjoy the perfect glass of wine, enjoy the breath of modern life. Belvedere resort is a great choice for your conference with three kinds of Ballrooms, which is able to satisfy different requirements of customers. 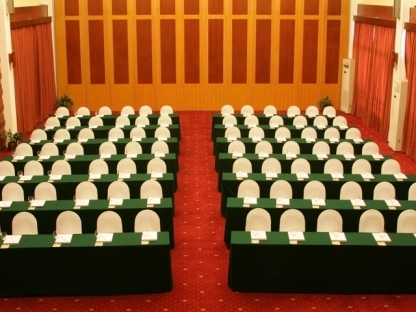 The conference rooms are decorated in traditional style, have modern facilities and audio-visual equipment.